Contact our convenience store for snack foods, fishing tackle, cigarettes, gasoline, a light grocery shopping, and beer store in Steinhatchee, Florida. The web server used by Caseyscove.net is run by Confluence Networks and is located in Road Town, Virgin Islands, British. There are many websites run by this web server. The operator uses this server for many hosting clients. In total there are at least 3,578 websites on this server. The language of these websites is mostly english. 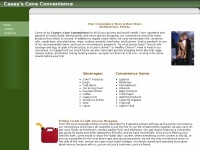 A Apache server hosts the websites of Caseyscove.net. The website prohibits search engines and webcrawlers archiving the website. Other actions by webcrawlers and bots are allowed.